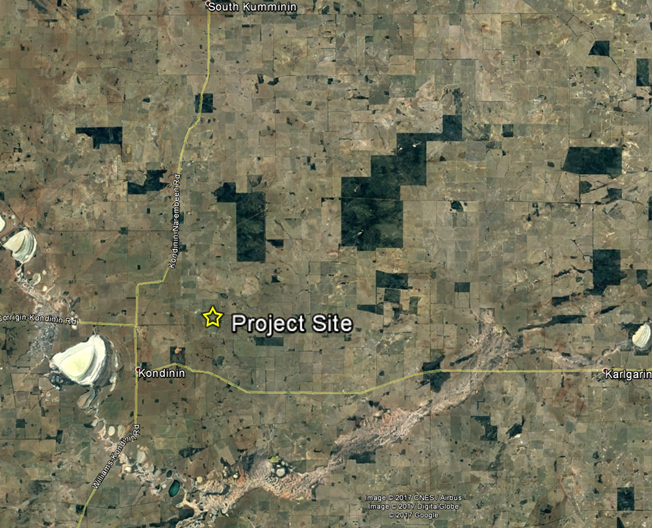 The Kondinin Wind and Solar Farm project, is located 5 km north east of Kondinin. The project will comprise of up to 46 wind turbines, approximately 50MW of solar panels and a battery storage facility. The project extends across the land of five farming families, with the wind turbines on the higher ground to the east and the solar farm located near the Kondinin – Narembeen Road. The project is an area of good wind and sun resources and close to the Kondinin electrical substation and the existing Highway. The electricity produced by the project will flow directly into the nearby Kondinin substation and then into the Western Power network. The close proximity to the substation means that the project can be built very economically compared to other locations. The construction period for the entire project will be around 18-24 months. The Wind and Solar Farm is currently in the feasibility phase with work being undertaken on the technical, environmental, social and economic aspects of the project. If the feasibility study demonstrates a viable project then it is intended that construction would commence in 2019.